No fifth party celebration is complete without balloons, party bags and cakes and thebestof Haverhill’s birthday bash at Days Inn Haverhill last week was no exception. The event was held to mark five years of trading for the local marketing specialist and to acknowledge the winners of the recent Local & Loved Awards 2015 campaign. Steve Phillips, head of reducing re-offending at HMP Highpoint, was at the meeting selling a range of products made by the prisoners in the tailoring department at the prison. The bags, cushion covers, children’s’ aprons and curtains are all produced from recycled textiles. Steve explained to guests the significance of the Make Amends brand name, how the project had started and their future plans to form a social enterprise. Elaine Carr, owner of thebestof Haverhill, announced that Reach community projects would be their chosen charity for the year and that support would be offered through a number of different fund raising events throughout the year. Henry Wilson from Reach spoke passionately about the services that the organisation offers local people who find themselves in hardship. He gave examples of how the charity works with individuals and families to get back on track. Although the Haverhill Food Bank is an important service Henry was keen to emphasise that the Foodbank is a symptom and not a cure. The other services that Reach offers, including debt counselling and money advice, were designed to prevent the need for the Foodbank. Certificates and prizes were awarded to the business members who had achieved success in the Local & Loved Awards 2015. Hanningtons Jewellers received the highest number of reviews during the competition to become the Most Loved Business in Haverhill and the Most Loved Jeweller in the UK. The team at Hanningtons gathered 118 reviews in just four months of membership of thebestof Haverhill. Their customers love them because of their friendly service and knowledgeability and the extensive range of jewellery and gifts available in their two shops on the High Street. Aron Woodward, the manager from Hanningtons, collected the certificates on behalf of the Hanningtons team. Taking the award for the Most Loved Nursery in the UK, for the second consecutive year and the second Most Loved Business in Haverhill was Dizzy’s Day Nursery in Hollands Road. Liz Nunn, the owner of Dizzy’s, was on hand to collect their certificates. 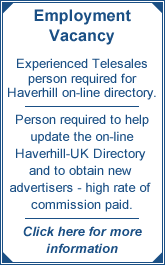 Dizzy’s have received over 1,000 amazing reviews since they joined thebestof Haverhill in December 2012. Elaine Carr, owner of the bestof Haverhill, said: “It was lovely to have a slightly different format for our fifth birthday event.